Toast pine nuts in saucepan or skillet over medium heat until lightly browned and fragrant. Set aside. Add butter to the warm pan you used to toast the pine nuts. Melt over medium heat until bubbly and beginning to brown. Add fresh sage leaves to the brown butter and fry until golden brown along edges. Remove HALF of the leaves to paper towel lined plate. While sage is frying, add water and Better Than Bouillon Roasted Chicken Base to separate pot (for pasta). Bring to boil, then add fettuccine and cook to al dente. Reserve the pasta water. Add minced shallot to the remaining half of the sage leaves and brown butter. Sautee until translucent. To the shallot, sage, and butter, add 1/2 c. pasta water, Better Than Bouillon Roasted Garlic Base, pumpkin puree, and optional red pepper flakes. Let simmer and add more pasta water to thin as needed. Once the sauce is hot and at your desired consistency, add a generous squeeze of lemon juice. Add cooked fettucine to the sauce and toss to combine. 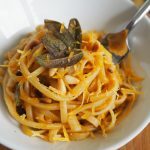 Garnish with toasted pine nuts, fried sage, and freshly grated Parmesan or Mimolette.